Here's mine. Fluxbox made to look nice and boring. xterms, tmux, xload, xconsole, lynx and firefox iconified. Last edited by IdOp; 2nd December 2010 at 02:54 AM. But yeah, there aren't that many NetBSD users here, but those showing up might appreciate it. Yup, immortalized in a bitmap! How good is that? PS: Sorry for posting a link like this but I don't have enough rights to post a hyperlink ... I need at least 5 posts to become a full-fledged "Daemon Forums" citizen. Last edited by classicmanpro; 2nd December 2010 at 06:51 PM. Here's the latest on NetBSD 8.0_STABLE, 8 years after starting this thread. Fluxbox with "everything" iconified. I'd love to give credit for the wallpaper, but it was found "somewhere on the Internet" and I no longer have the link. I did edit it significantly with gimp to switch parts of it to darkslategray. Last edited by IdOp; 15th October 2018 at 01:29 AM. Here's the latest on NetBSD 8.0_STABLE, 8 years after starting this thread. Your setup hasn't changed very much in those eight years. What's that clock below xload? It almost looks like a terminal window with a scrollbar on the left. Your setup hasn't changed very much in those eight years. I know, I'm kind of resistant to change. But sometimes I do use NetBSD to experiment with changes a bit, such as adding the wallpaper. Another "major" change was having ~ in my shell prompt instead of "/home/userid", lol. What's that clock below xload? It almost looks like a terminal window with a scrollbar on the left. It's actually an xmessage window, indeed with a scrollbar. I have a shell alias to set an alarm, which beeps twice. Under X it puts up the window with the alarm time so I know when it will beep, or after it beeps when it did. The message stays up for 10 minutes after the alarm. It helps tear me away from the computer to do other things. Another "major" change was having ~ in my shell prompt instead of "/home/userid", lol. That's approaching Chuck Norris levels of badassnes! Bonus points for adding a wallpaper. That clearly demonstrates you're not afraid to push the envelope. Cool idea. Though, if you struggle getting away from the pc, you could always take the fait accompli route and have the machine shut down automatically instead of just beeping. 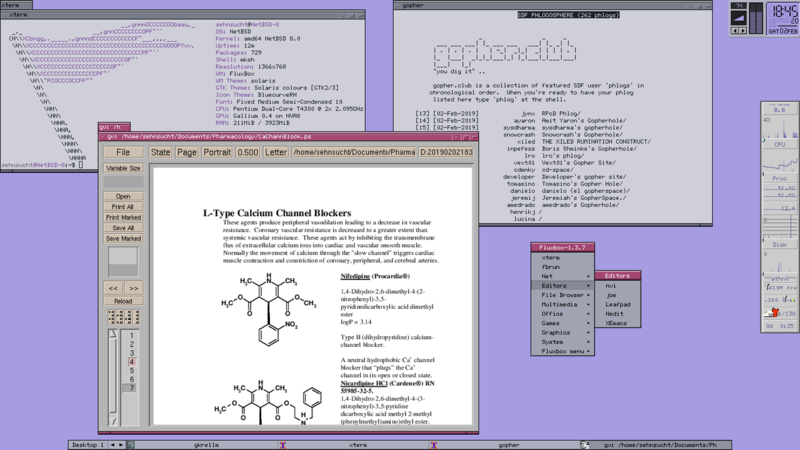 That's a screenshot of Donald Knuth's FVWM setup. No-nonsense and to the point, nothing wrong with that. Lol, I enjoyed the humour and the Knuth screenshot. I guess one could always ditch the window manager, fill the screen with emacs, and do everything in there? Err, well, maybe not. my compliments, that's a really nice setup. Would you mind kindly sharing your wallpaper and conky config?